I spent Tuesday inside a cage. Not my usual way to spend a sunny Tuesday ~ but for the Palestinian farmers I was with, this is routine. This is because their land happens to be near the illegal Israeli settlement of Ariel ~ in fact, it is in the Israeli imposed ‘buffer zone’ between the largest settlement in the West Bank and the surrounding Palestinian villages ~ of course, the buffer zone is created out of land outside of the settlement, effectively grabbing yet more land from the Palestinians. Many olive trees are trapped in this ‘buffer zone’ between a fence on one side and Ariel on the other. 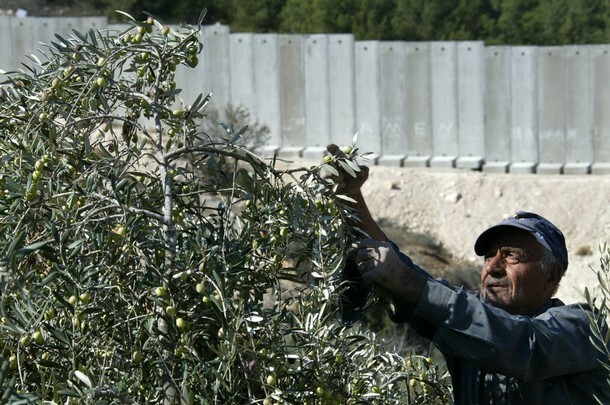 So, during the Palestinian olive harvest, the villagers who own the land must ask for Israeli permission to access their own trees ~ as is typical across the West Bank. However, they have a second hurdle to cross, as their trees are behind this fence, the soldiers need to let them in and out every morning and evening. The gate is meant to be opened at six every morning, during the 20 days that villagers have permission to pick olives inside the cage ~ some farmers have to set off from home before 5am to get there on time to be allowed in. Five soldiers deigned to grace us with their presence at around 6.15, zooming down their patrol road in a military jeep. They opened the first gate onto the road, then past the rolls and rolls of barbed wire separating this from the next gate, eventually coming down to permit access to the sixty Palestinians, who were waiting patiently outside, as the sun rose over the hill. The soldiers took the ID card of every person who passed, impatiently gesturing at people to hurry up with their guns. When we had all crossed the patrol road and into the third gate into the cage-proper, the door slammed shut behind us. We were locked inside until 4pm, when the soldiers would come and release us. This length of time has severe implications for the farmers picking inside the cage ~ if anyone is ill or gets injured over the course of the day, there is no guarantee that medical help would be able to reach them. Children can’t join their families picking olives after school. If families don’t pick their olives within the permission time, they will lose them. Multiple trips can’t be made during the day ~ any olives that need to be removed have to be taken in one go at the end of the day ~ and this can be a lot. More than anything, the loss of autonomy and control over your own life and livelihood is devastating. The family that I was picking with didn’t actually own the land ~ they rented it from another family who live in a village very near to the land. However, because of the cage, it would take them around three hours to reach their trees. So although the majority of Palestinian families have a deep connection to their trees and their land, this family needed to sacrifice this for the practicality of allowing someone who lives closer to farm their land. Actually picking the olives was trouble free. We saw one settler, jogging past on the other side of the fence ~ apparently there are sports fields there. 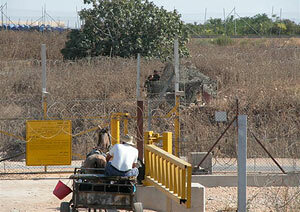 At the end of the day, we walked the forty minutes back to the gate and waited for the soldiers to let us back out. This time, they called people one by one, handing them back their ID cards. This took rather a long time. At the end, there was one woman left ~ for several tense minutes, the soldiers couldn’t find her ID card and held her back. Her relief was tangible when it was found, and she was allowed to follow the rest of her family out of the cage. Palestinians need their ID cards for all aspects of their daily life, to have it go missing would be a big problem. 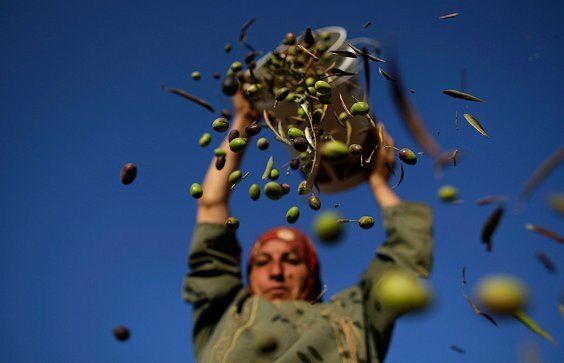 Israel aims to humiliate and control the Palestinian farmers ~ with great dignity, patience and steadfastness, the Palestinians gather their olives year after year, waiting until the moment when they will break free from the cages.